In the School of Science and Engineering, our objective is to help students gain a profound understanding and knowledge of natural science and scientific technology as well as acquire logical thinking skills and the ability to devise novel approaches. To this end, we offer methodically planned education over the course of four years with value given to fundamentals and foundations. By cultivating studentsf problem-solving skills, we hope to produce individuals with a broad perspective and the ability to properly address issues and situations in the society with science and engineering as the backbone. In the fields of science and engineering, students are expected to approach their course work with the expectation of continuing on to graduate school after four years of undergraduate education In the School of Science and Engineering, more than 65% of the students go on to graduate school. Each course features curriculum that is designed to be completed in the four-year undergraduate program. In addition, we also offer a sequential undergraduate/masterfs program, including an early graduation system that allows students to graduate in three years. The Graduate School of Science and Engineering offers uniquely designed educational programs aimed at nurturing the ability of students to find problems and solve them based on systematic and comprehensive knowledge fundamental to each field. Two of our programs have been selected as recipients of the Support Program for Improving Graduate School Education, a prioritized support program of the Japanese Ministry of Education, Culture, Sports, Science and Technology (FY2007 - FY2011). Our programs allow students to take courses in related fields and give them ample opportunity to experience different areas. Through those efforts, we aim to train highly creative researchers and specialists with a broad vision. As in the case of all graduate schools in Japan, the Graduate School of Science and Engineering at Tokyo Metropolitan University offers master's degree programs (two years) and doctoral degree programs (three years). 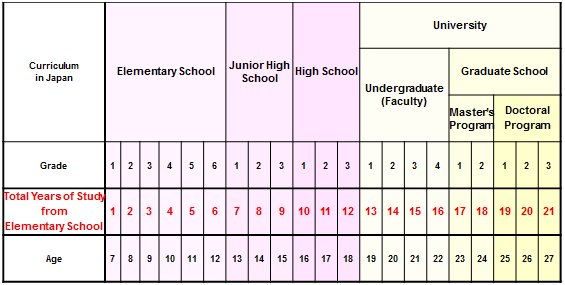 The figure below illustrates the Japanese educational system. Applicants are required to take the entrance exams for admission to the master's program and the doctoral program. Students will receive a master's degree upon completion of the master's program, and a Ph.D. upon completion of the doctoral program.